When I think of all the beautiful venues I get to shoot at as a Colorado Wedding Photographer, the Lyons Farmette is the one that stands out to me the most as a fun and unique wedding experience. I believe that it's the experience you have on your wedding day that matters truly the most, and that is what you'll get here. I had the honor and pleasure of collaborating with some of the best wedding vendors in Colorado at the Farmette to create a styled wedding shoot that was full of bohemian flair, colorful settings + decor, and a whimsical feel. We found our models Morgan + Chris who were a perfect match for this shoot as they are both artists themselves - very talented musicians - full of love for each other, tons of playful energy, and let's face it - they are drop dead gorgeous together! I am so proud of the work we did, and I'm excited to share that my photos from this shoot were published on Wedding Chicks too! So, here's some wedding inspiration for all of you brides out there planning your wedding in Colorado at a farm and garden venue. Happy Planning! A special thank you to all of the incredibly talented + awesome vendors who made this shoot possible! You are all amazing and I am so lucky to work with you! These are the adorable alpacas you'll see when you arrive at The Lyons Farmette! They are so much fun to pet. Here is the amazing invitation suite that Carolyn Haines over at Loud River Creative made for our shoot. They had real gold foil accents and watercolor to compliment the table runners that Darcy at Dahlia and Designs Events dip-dyed herself! 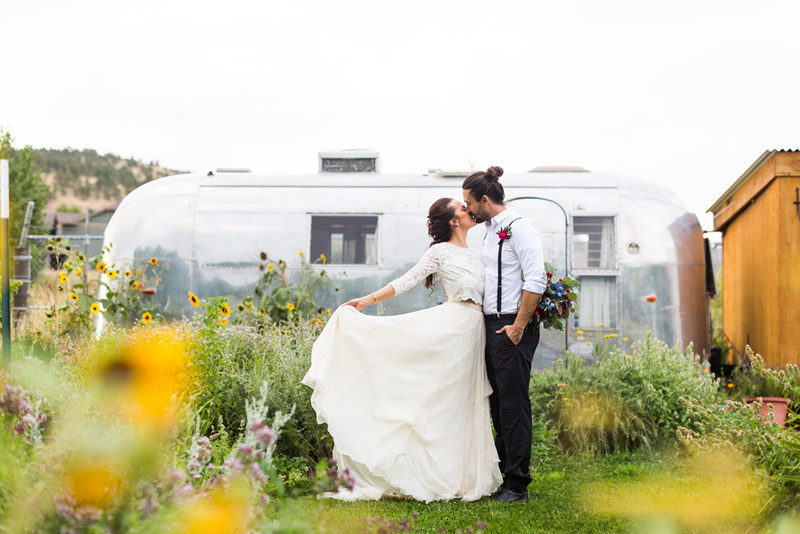 I absolutely love it when brides use the airstream trailer to get ready. The Farmette has really done a good job of transforming it in to a super cute space! The personal florals for this shoot were done by Kristy Nichols at Niwot Florist. She is actually a past bride of mine and so much fun to work with! I love her use of color and texture in this wedding bouquet. I cannot brag on Helen at Farmette Flowers enough for the creativity she brought to this shoot when making the ceremony backdrop we used at the small riverside ceremony site. I was ooohing and ahhhing the whole time I watcher her put it together! Chris and Morgan exchanged their rings and vows again in style. Nate over at Garnish Bartending has the coolest mobile bar set up I have ever seen at a wedding. I LOVE those barrels, and the specialty cocktails he makes are superb! Jessyca over at Bezalel and Babel made these custom dip-dyed, hand painted signs for our shoot. If you haven't ever seen her work, you should absolutely go check her out! She has an etsy shop with something for everyone. Those specialty cocktails are just YUM - I 'may' have had a sip or two for quality testing. After cocktail hour we headed over to the garden where Darcy had set up the most beautiful table scape for the bride + groom. I am still just totally in love with the agate slice place cards, cactus table numbers, and gold geometric decor. After dinner I snuck away with Morgan + Chris to take some romantic wedding photos in the garden which in my opinion is the best part of getting married at the Lyons Farmette! After taking a few photos in the garden we headed across the bridge where The Bumblebee Truck set up wedding desserts. Warning - the next images you see may make your mouth water! As we were walking back from the Bumblebee Truck, I was inspired to have Morgan + Chris dance on the bridge surrounded by all the twinkling lights. They were so sweet to each other with every step. You know me! I am all about the romance. I noticed the light was starting to fade and turn gold. Which is my absolute favorite light to shoot in, so we strolled over to take some couple portraits in front of the flowers by the driveway. The light was heavenly, and Chris + Morgan were so snuggly and playful. It was an amazing way to end our shoot!